My Occasional Blog: Where in the world? The main map window in Lightroom. Dragging a photo from the filmstrip at the bottom onto the map will embed the location data. In this case it’s reporting that I have 72 photos in my catalog made at the traffic circle in Poipet, Cambodia. Lightroom has a mapping component built into it that can make it easy to figure out where you were when you made that once in a lifetime photo. There are a couple of way to embed the data. The easiest and most reliable way to do it is to use a camera that has built in GPS, like the Canon 6D. If you turn on the GPS function (consult the camera manual for specifics) the camera will log your location as you photograph and embed your GPS data in the metadata. 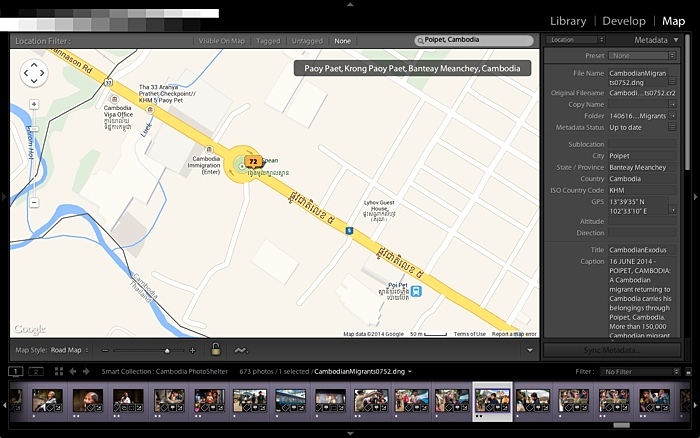 When you import the photos into your Lightroom catalog, they will automatically show up on the map. If you don’t have a 6D, or one of the other cameras that embeds GPS data, you have to work a little harder to get the location data into your file. In my case, I use an iPhone and the camera in my iPhone to tell me where I am. I usually have location services turned on. When I’m photographing in a new place, or a place where I’m not sure of where I am, I take a couple of pictures with my iPhone. I import the “real” pictures (those made with my 5D Mark III) into my LR catalog then I import the photos from my iPhone into the same folder in my LR catalog. I keep the clocks in my cameras and iPhone in synch, so if I have a picture made at 6:20AM with my iPhone, and pictures made at 6:19AM and 6:21AM made with my Canons, it’s a safe bet that the pictures were made at the same location. I then copy the location data from my iPhone over to the pictures made with my Canons. Finally, if you don’t have an iPhone or GPS enabled camera but you do know where you were when you made a picture, you can embed the location manually. Click on the Map module in Lightroom. This will take you into the map mode. Turn on the “Filmstrip” view at the bottom of the LR screen. Back in the map, zoom into the specific location where your photo was made. How far into the map you have to zoom depends on how specific you want to be. If all you care about is the city and province, you can work at low magnifications. If the actual GPS coordinates or specific street address are important you should zoom in until you can see your specific location. Select the photos in the filmstrip view and drop them onto your location on the map. Lightroom will fill in the location data in your IPTC, including the GPS coordinates. That’s how I got the location data into the pictures at the top of this post. I didn’t actually make 72 pictures at the traffic circle. I made them in the vicinity of the traffic circle, all within a hundred meters of the circle, but dropping them on the traffic circle was close enough for my needs (which was just the town and province in Cambodia where I made the photos). It’s easy to tell at a glance if your photos have location data embedded in them. The icons in the bottom of the LR thumbnail tell you a lot about the photo. 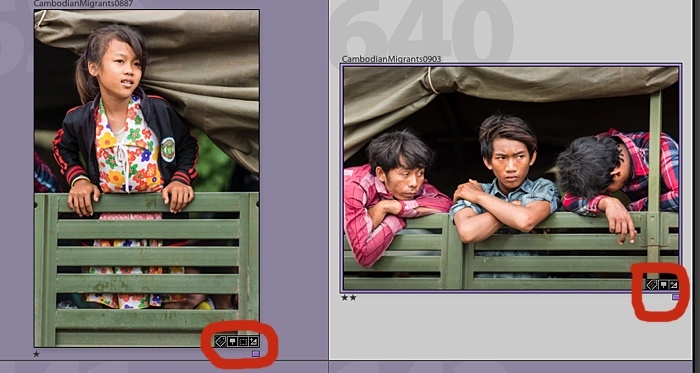 When you’re in the grid view in Lightroom you’ll see a series of icons in the bottom right corner of the photo (circled in red in the photo above). The icons mean (left to right): keyworded (the tag), location data embedded (the pushpin), cropped (the rectangle) and developed (the +/- on the far right). Lightroom makes it easy to remember where you were when you made your photos. Don’t be afraid to go into the Map module and do some exploring.